My coworker mentioned she has lunch here on a weekly basis. With her recommendation, I decided to checkout Addie’ for a (late) breakfast. Addie’s is located in Old Boise, on the corner of 5th and Main Street. 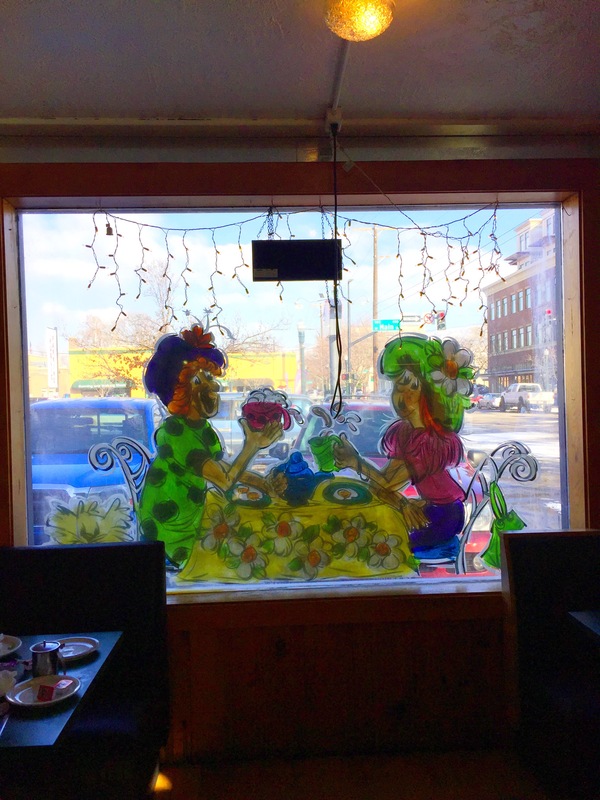 It has the most decorative window art I’ve seen so far (excluding all the window paint for the holiday season). My favorite is the painting of two ladies sitting at a table, sipping tea. 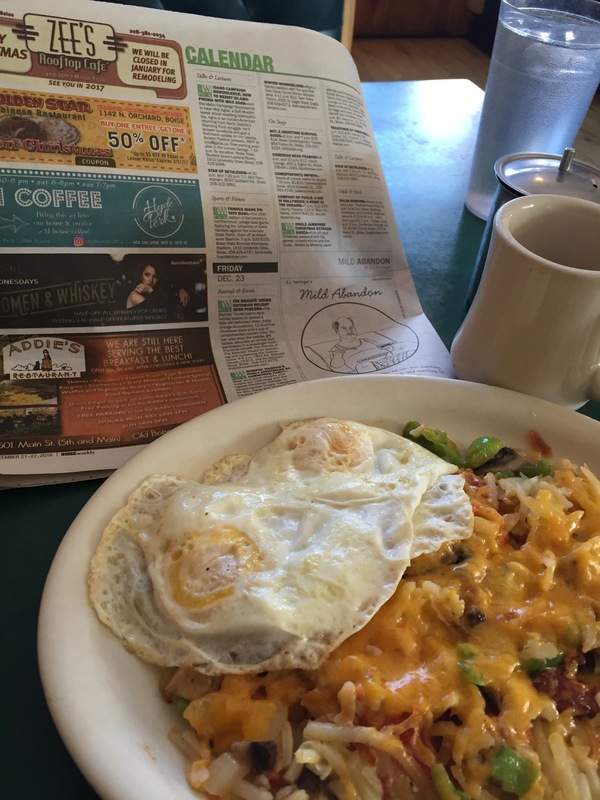 With Boise Weekly in one hand and my wallet in the other, I headed into Addie’s. After being greeted with a warm smile, I was instructed to find my own seat. I chose a comfortably-sized booth facing Main Street. Before I even had the chance to sit, a young man with framed black glasses, dressed in a vintage-styled sweater covering a joker tee-shirt, with his hair pulled up in a ponytail asked me if I wanted coffee (bottomless coffee, by the way). I quickly responded with yes! and sat down. While perusing the menu (and overwhelmed with the delicious choices), I overheard one college student order the meat skillet. I thought that sounded rather scrumptious (well… Maybe my mind didn’t use the word scrumptious, but it’s a good word for this blog). This is my first time here; what do you recommend? Waiters, you probably hate this question but I like to know what is the most standard meal at a restaurant I’ve never been to. Oh, that word skillet. What the hell is a skillet? I embarrassed myself and asked what it was. Believe it or not, I never knew that hash browns mixed with meat & veggies was called a skillet! My parents have made that before on our Sunday mornings. I’ll take the meat skillet please! I said enthusiastically. Maybe too enthusiastically. While waiting for my food, I read the newest Boise Weekly, marked down a few events for my reference, like the Humpin’ Hannah’s Fugly Nightmare B4 Christmas Party (which I’m going to anyway) and the Treasure Valley Children’s Theater: Little Women showing). What seemed liked only a few minutes, the young waiter approached my table with a plate topped with some fried eggs & a meat skillet covered with melted cheddar cheese. Basque chorizo sausage mixed with crispy hash browns, and the soft texture of melted cheese was a party in my mouth. Seriously. Let’s not forget about the fried egg on the side, which I kept forgetting to eat because the allure of the meat skillet kept my attention. 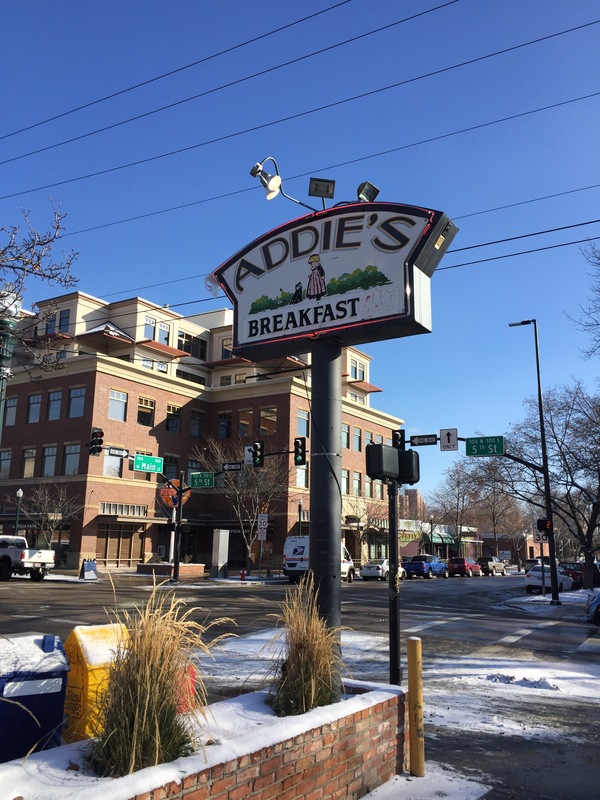 If you’re looking for a diner with its fair share of comfort food, add Addie’s to your Foodie #boisebucketlist. So 1 down, 9 to go! What should I do next…? And don’t forget, if you want to party & dance with me this Friday night, let me know! Email me at theboisebucketlist@gmail.com. If you’re new to Boise & looking to explore, I’m your person.